Wat Po is one of my favourite places in Bangkok. Everytime friends come to Bangkok to visit me, this is on my “must see” list. And so far, everyone’s always been deeply impressed by their visit to Wat Po. 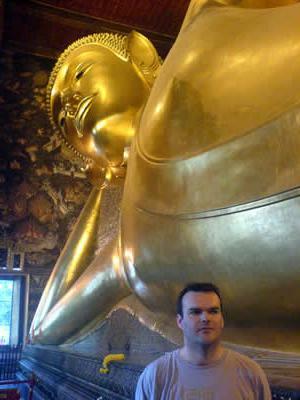 I think this is for a couple of reasons – the first being the temple’s star attraction and main draw for tourists, the Reclining Buddha. Over 46 metres in length and 15 metres high and swathed in gold leaf, it’s impossible to convey the size of the Buddha in words or pictures. Indeed, it’s pretty hard to fit the Buddha into a photograph at all. Built in the 17th century and modified and expanded by successive Thai Kings since then, Wat Po is actually older than Bangkok itself – King Rama III built the chapel of the Reclining Buddha in 1832. 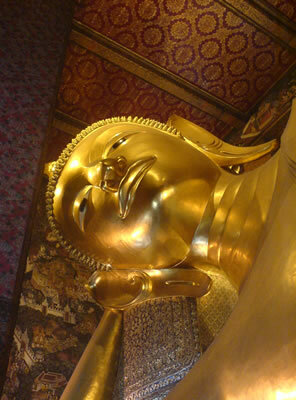 Even knowing what you are going to see never quites take the edge of wonder off first seeing the Reclining Buddha for real. It is a truly beautiful creation, not just because of its size but in the grace of its features and the amazing mother of pearl insignia embedded into the soles of the statue’s feet. The moment friends walk into the chapel of the Reclining Buddha, I always treasure the look of complete surprise and the smile on their faces. It doesn’t matter how many times I say “we’re off to see the big Buddha”, no one’s ever prepared for quite how big it really is. 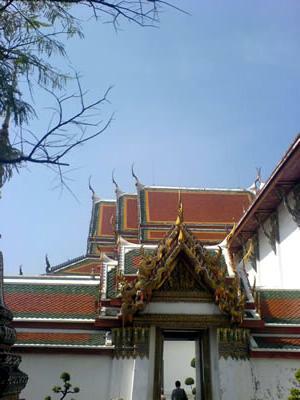 While the Reclining Buddha is a major tourist attraction, as it’s only a 10 minute walk away from the Grand Palace, it’s not nearly as crowded at Wat Po as the Grand Palace itself. The Buddha has a suitably calm reverence around it, which is quite tranquil. The only sound you’re likely to hear besides people’s whispers is the dropping of coins into the 108 prayer bowls that line the wall which runs behind the Buddha’s back. This is meant to bring good luck and you can get a bowl of coins to drop for yourself for a small donation. It’s important to remember that Thailand’s temples are heavily reliant on donations for their upkeep, so giving even a couple of dollars helps. Outside the Chapel, the temple grounds of Wat Po itself are a fascinating and architecturally stunning place to walk around. The tourist crowds largely don’t explore them, coming in to see the Buddha and then leave again – but there are amazing temple roofs and chedi, the enormous mosiac-embossed towers, just a few steps away in the temple grounds, along with a real mix up of statues of mythical creatures. 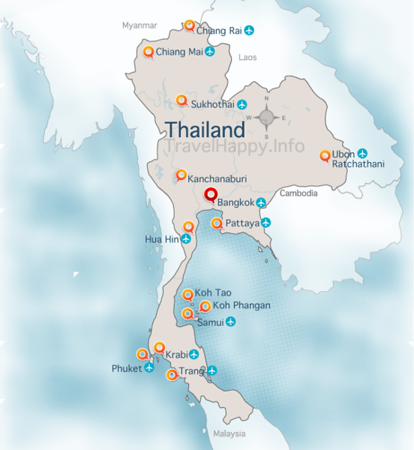 There’s also Thailand’s oldest and most prestigious massage school here, where you can both receive a massage and train in massage techniques too. Wandering the grounds is a riot for the senses and yet a wonderful escape from the madness of Bangkok’s street life. Seeing wonders like the Reclining Buddha and the soaring, gravity-defying architecture of the temples is genuinely uplifting, whatever your spiritual beliefs (or, in my case, lack of them).